If you’re looking to buy a midsize crossover with three-rows of seating for those important family duties, the Ford Explorer has been a great choice for almost 30 years now. Smaller and more carlike than a full-blown truck-based Expedition SUV but roomier and with more seats than the midsize Edge, the 2019 Ford Explorer is definitely worth a closer look. The current Explorer is now in the last model year of its fifth-generation before a new sixth-generation arrives next year. Let's see what this current model has to offer then, especially as there could be some great deals to be had on this one ahead of an all-new Expedition arriving on the horizon. It's hard to believe by looking at this version of the Explorer that it's now been with us since as long ago as late 2010. To say the exterior design has aged well is something of an understatement. There's an obvious family resemblance with the smaller Edge, and the front fascia of the Explorer looks every bit as contemporary as its smaller sibling. The rest of the Explorer is very SUV, although we know the underpinnings are unibody rather than truck-based ladder-frame. There are three engines to choose from and there isn’t a dud among them. The standard unit is a 3.5-liter V-6 which puts out a healthy 290 horsepower and 255 lb.-ft. of torque, but most buyers are likely to gravitate to the more modern 2.3-liter EcoBoost four-cylinder turbo. The four-cylinder engine develops 280 horsepower and 310 lb.-ft. of torque, but there's even more power available in the lineup if you want it. The most power comes from a sensational 3.5-liter twin-turbo V-6, which then means the Explorer has 365 horsepower and 350 lb.-ft. of torque to play with. All three powerplants come mated to a six-speed automatic transmission, and all models except those with the 3.5-liter twin-turbo are standard front-wheel drive. All-wheel drive is available, and it's standard with twin-turbo V-6 variants of the 2019 Ford Explorer. Interiors matter with family-focused model like the Explorer, and the amount of space inside really matters. Even with all seats in place there's a useful 21 cu.-ft. behind the third-row for cargo. That capacity grows to 39.2 cu.-ft. if the third-row is folded away, and there's a maximum of 73 cu.-ft. available with both rows of rear seats fold. The quality of the interior trims and materials is entirely price-appropriate, but at Platinum trim level the soft leather upholstery is a match for some genuine luxury models costing considerably more than the Ford. Entry level models come standard with air conditioning, a power driver’s seat, alloy wheels, cloth upholstery, and a 4.2-inch infotainment screen, but most models on lots will be the XLT or higher. The XLT adds a 10-way power driver’s seat, Reverse Sensing, Intelligent Access with push-button start and SiriusXM with a 6-month All Access trial subscription. The XLT can also be upgraded to include a larger 8.0-inch touchscreen infotainment system that's also Apple CarPlay and Android Auto compatible. 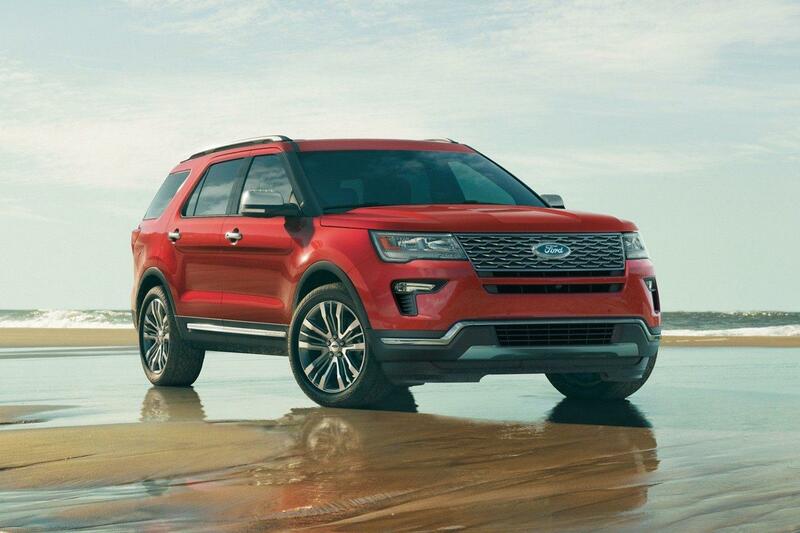 To find out more about the great deals available on the 2019 Ford Explorer 7-passenger SUV and to try one out for yourself on a test drive, get in touch with us today here at Ford of Upland, your premier choice Ford dealer in Upland, CA.